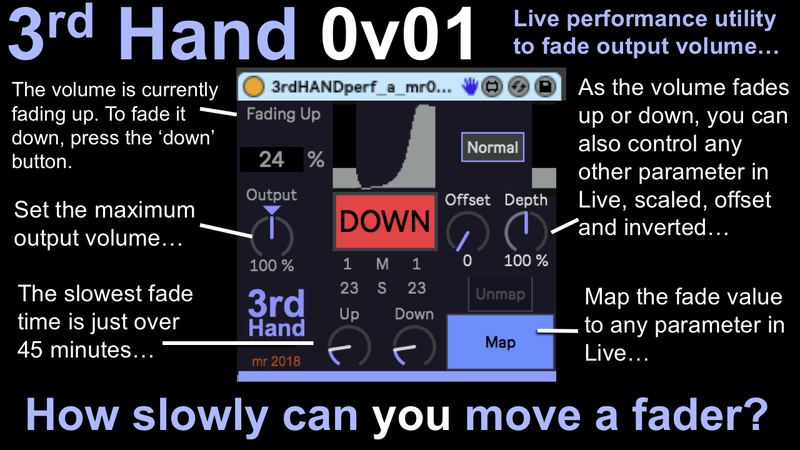 Because 3rd Hand is a volume control, then the first control, labelled ‘Output’ is a… volume control. It lets you set the maximum output, and has quite a lot of gain for maximum flexibility. Just set the Up time to a short time and press the ‘Up’ button, and wait until you get to the 100% ’Maximum volume’ level, and then adjust the Output control to the loudest you want to reach. 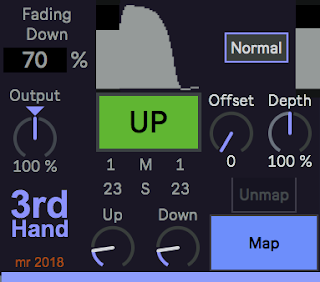 3rd Hand alters the volume of anything that you pass through it, so you should put it at the end of your effects processing chain. The Up and Down time controls have a big range. Note that they don't have normal parameters shown underneath - instead the parameters are shown ABOVE the rotary controls. You can see this by altering the rotary controls - The Minutes and Seconds should change. 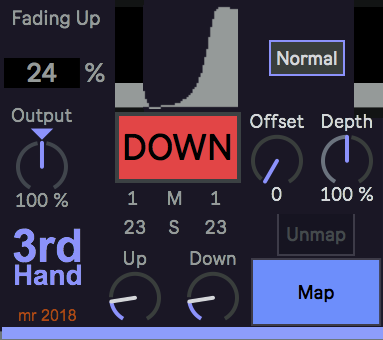 If nothing seems to be happening when you press the Up/Down button, then make sure that the ‘M’ setting isn’t several minutes… The bug reports that I got from the beta versions were mostly along the lines of: ‘Doesn’t work. No output.’, followed by ‘Ah, I see!’ later on when they found that ‘M’ means minutes (and ’S’ means seconds). Ready to Fade up. Press the 'Up' button to start fading upwards from zero. Note that the button has changed to 'Down', so you can press this at any time to abort the fade up, and 3rd Hand will fade the volume back to zero again. If you don't press the 'Down' button, then the fade up will just continue upwards. The fade down gradually slows as it gets near zero volume. Note that as soon as the fade downwards starts, the button changes to 'Up, so that you can abort the fade down (if you pressed the button by mistake, foe instance) at any time. When the fade down is complete, we are back in the 'Zero Volume' state, where we started. And that's mostly it. 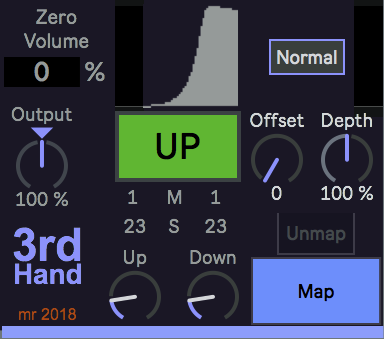 3rd Hand is probably the most sophisticated simple device you have seen, but it is intended to do it properly, reliably and flexibly. 3rd Hand is meant to be used in live performance - in the above example, it is being used to control the output of BankOSCmr 0v02, which kind of fits the 'drone' genre I mentioned right at the start of this blog post. You could use it otherwise, of course. (One immediate thought is to have one 3rd Hand on several tracks and to use them to bring stuff in and out slowly.) Anyway, enjoy big slow builds! You can download 3rdHandperf_a_mr0v01 for free from MaxForLive.com. 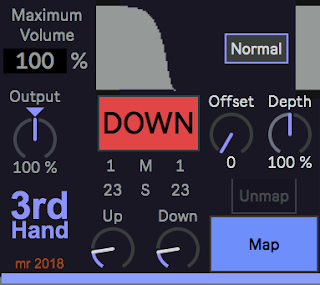 In terms of modular equivalents, then reproducing this simple functionality in my modulars involved 2 VCAs and an Envelope Generator, plus a Button trigger, and a Utility voltage processor, so I would rate this version as being about 5 ME.